I’m packing a suitcase for a trip to Poland with my hubby and mom and while I still have a moment I wanted to share I card made using the Hero Arts Hibiscus Color Layering stamp set. I’ve been wanting to use it, but I had no idea what colors to pick for this flower, so I went to Pinterest last night and looked up Hibiscus images and got inspired to do some stamping. One might think that it would take a lot of time to stamp a background like this, but it really doesn’t. I don’t think I spend more than 30 minutes making a background for this card. I wanted to stamp Aloha, but it turns out I don’t have a stamp like that, what a shame. I used a sticker from Seven Papers (discontinued) instead and since it already had some gold on it I layered it on top of a gold heat embossed heart that I created using a pretty heart image from the Love By Lia set and vellum. 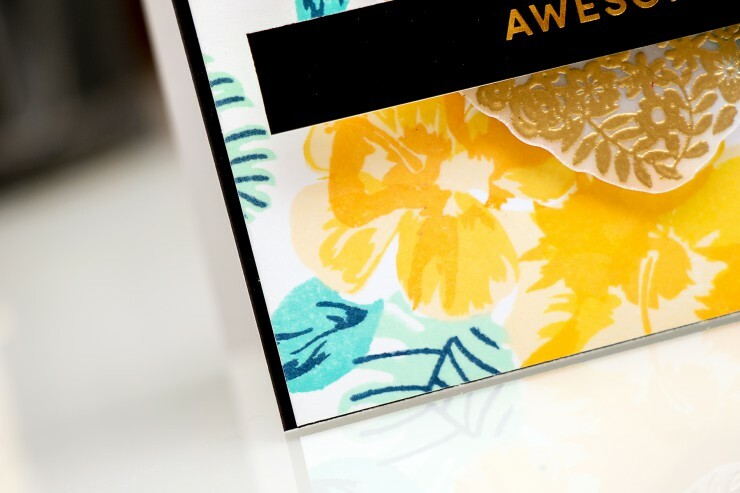 I used a few colors of ink to do my stamping – started with the Soft Vanilla, added Butter Bar on top and used Orange from the Yellow to Orange ombre pad as my darkest color. For the leaves I used Mint Julep, Tide Pool and Navy, I just really love this color combo and keep coming back to it over and over again. 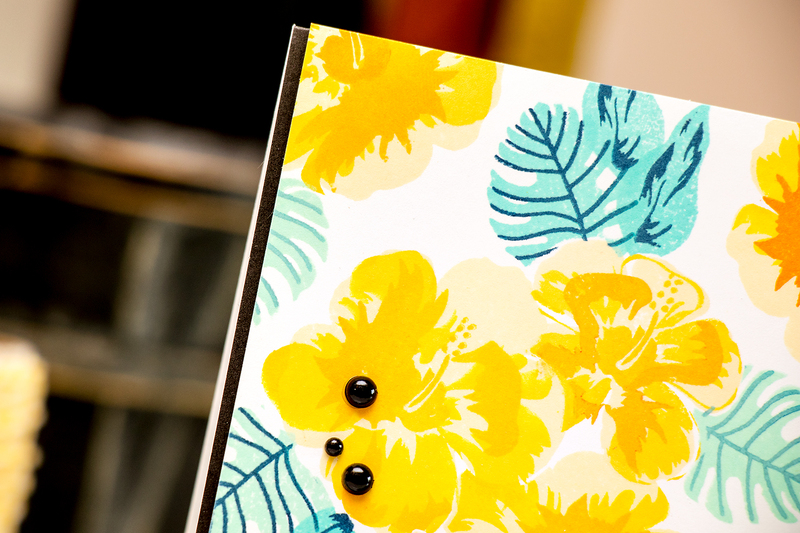 I used Hero Arts black layering paper for the base of my card and added black pearls to finish the project. Love the way it turned out, perfect for summer! Would you like to win a $25 Gift Certificate to the Hero Arts store? Thank you Hero Arts for sponsoring this giveaway! For your chance please leave a comment below and let me know if you like to travel. Thanks! I will be back from Poland on the 1st of July and will randomly pick one lucky winner! I will post the winner here in this post and also on the sidebar to the right. The winner is Rebecca Ednie! Congratulations! Sorry it took me a bit longer to get back into my usual routine and post the winner. Rebecca, I’ll pass your e-mail address to Hero Arts to get you your gift certificate. Thank you everyone! I enjoyed reading all of your comments! Not only is Jennifer McGuire an enabler when it comes to products, but also artists! I am glad I found your blog, Yana! Your cards are beautiful! Люблю подорожувати, але виходить дуже нечасто. А забаганок щодо планів – море! Тропічний острів теж в них входить. I love the color combination! I like to travel but my family does not(teengagers), so for now I will enjoy staying at home with the kids! Дуже гарна листівка. Ви зовсім не боїтесь використовувати чорний колір, на Ваших листівках він виглядає дуже елегантно. Я теж дуже люблю подоружавати, особливо по Україні. Хочу об’їхати всі замки. This card is just beautiful Yana! 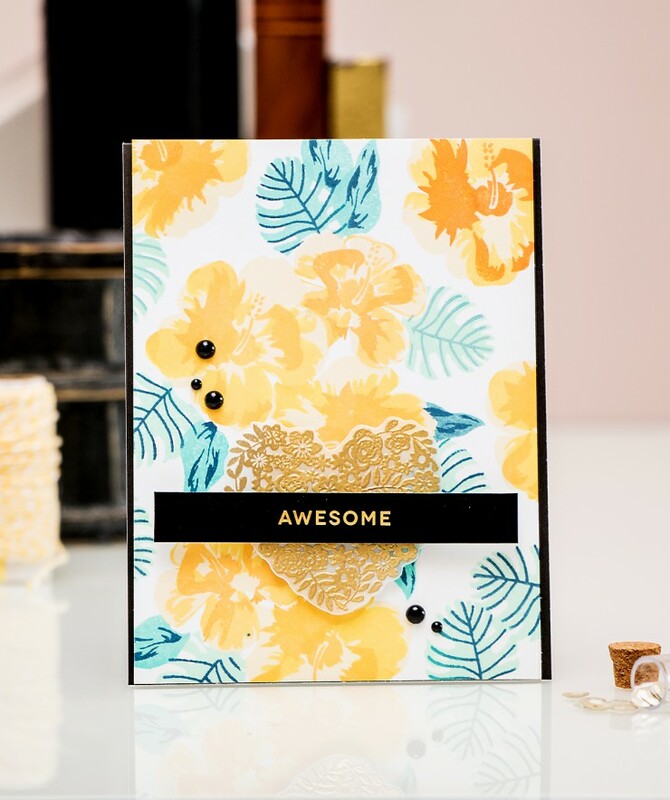 Love the soft, buttery yellow of the flowers with the black sentiment panel and the gold embossing on the heart! I’m more of a stay at home type myself, but could be convinced that some travel would be good for me. Love your blog and your inspiration. Great card and love to go on vacation but don’t get to go to often anymore. Saw your cards on Jennifer’s YouTube video. Found them simply stunning! I love the way you choose your colors. Yes! I love to travel..looking forward to some travel coming up in July and August. Enjoy your Poland trip. Travel,art and family and good food and friends: the best things in my life. Yana what a pretty card. I love to travel but have yet to leave the country. I am actually going down to visit my sister next month. This year it seems I might also be taking my first ever cruise! Яно, в тебе вийшла така літня насичена кольорами листівка! Чи люблю я подорожі – так! Але з дітьми поїздка до місця призначення перетворюється на випробування. Мрію про відпочинок на морі! Oh wow this is beautiful! I love this stamped background so much! The flowers and the colors are so gorgeous! And thanks for the chance to win! Yes I do love to travel. I have done a lot of traveling inside the country but Have yet to go outside the country. Hoping to go to Italy very soon! Such a stunning a drop dead gorgeous card!!! I love to travel!!! I hope you are having lots of fun in Poland!! No, I don’t have the urge to travel. I’d rather be crafting! Яна, замечательная открытка! Навевает мысли про отпуск и путешествия) Я люблю путешествия, особенно летом на море, а зимой в Карпатские горы! Чудова листівка!!! Мені дуже подобаються твої листівки з відштампованим фоном. Жёлтый гибискус-символ Гавайев.Эта открытка гавайская даже без надписи алоха:) очень красивая.Мне кажется воспоминания о путешествиях всегда самые яркие 🙂 Путешествие -это маленькая жизнь и большое счастье.Я обожаю путешествия.Желаю хорошей поездки! I love travelling but I always have to take a minimum but meaningful amount of craft supplies with me. Inspiration comes when I least expect it and I would like to keep my hands busy at all times. Yana, you are so amazing. I always love to see your color combinations, they are not always traditional but they are beautiful. Thanks for sharing your love of stamping and card making with me and everyone else. Wow this is stunning! I love traveling and can’t wait to do more! I love to travel, visiting new places and exploring. Thanks. I love to travel, but unfortunately my hubby isn’t as enthusiastic! Thanks for the giveaway! Your card is so gorgeous! This card is very beautiful … Travelling is one of the greatest things in life for me!! Awesome design!!! I loooove to travel around the world and visit different countries! This card is amazing!! !… Thank you for giveaway!!! And VERY like traveling!!! Откритка клас!У Вас Яна є талант надихати людей) І з откритками і з подорожами)Я теж люблю подорожувати,але найбільше люблю Карпати! I love this summer card, Yana! Yes, I do like to travel, because my husbnad is the most fun person to travel with! Thanks and thanks to Hero Arts for this fun giveaway. Another beautiful card! I would LOVE to travel!! So far just Canada & other states but one day I hope to cross the ocean! I have a list of dream vacations! Чудова листівка! Прекрасне поєднання кольорів. Ніколи не думала, що м’ятний так гармонує з жовтим. Взагалі, Яно, всі твоі листівки вражають кольоровою гамою. А подорожувати я дуже люблю. Напевно, немає таких людей, яким це не подобається. І велике спасибі за розіграш. Всім удачі!